Notebook 2.0 arrived this week in the App Store. In addition to its new status as universal app that works on all of Apple's mobile devices, the note-taking app also now offers Dropbox syncing—allowing users to recover their notes as .txt files from their personal computer. Notebook is otherwise a basic affair—as its own developers have observed, the app doesn't offer text-editing layout, or formatting capabilities. But it does have a “data detection” feature that creates phone numbers, websites, email addresses, and calendar events. Notebook comes with its own layer of security, offering users the option to set a passcode for the app so that private notes aren't accessed by others. And the app's Dropbox capabilities also also allows users to share their notes with collaborators. 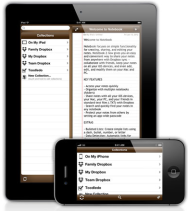 Notebook 2.0 costs $5, and is compatible with devices running iOS 4.2 or later.